Purefecto: The most gorgeous villa I have ever stayed at! The most gorgeous villa I have ever stayed at! I know I have said in the past "this is the most gorgeous villa I have ever stayed at" before. But this one truly is! LOL. I suppose I've cried wolves one too many times. With that said, my villa at Cheval Blanc Randheli is the most expensively decorated villa I have ever stayed at bar none. We are talking about Minotti furniture, drawers with stitched leather lining, etc. Well, let me take you all the way back to Male first. 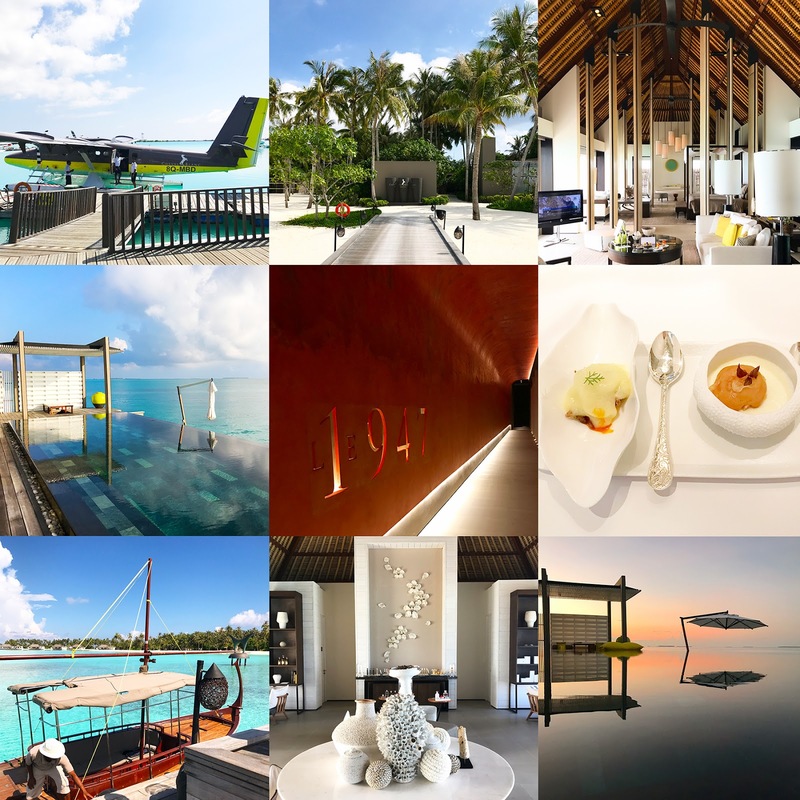 Once we arrived at the capital of Maldives, we were ushered by several ground staffs from Cheval Blanc and were whisked off to their air conditioned reception room in the seaplane section of the airport. We were given a snack menu. I wasn't particularly hungry so I only had one pastry and a glass of freshly squeezed juice. And yes, they literally made the juice onsite. We waited for about 20 minutes and the Cheval Blanc's private seaplane was ready to take off. The seats were covered in leather and there were 9 of them total. I believe the public seaplane has 18 seats. Thus CB's is obviously more spacious and comfortable. Staff handed out ear plugs and off we go. The interior of the seaplane was not air conditioned so it was a bit warm. But as soon as we were air born, it got cooler. After flying for about 40 minutes, we arrived at Cheval Blanc dock with 7 staffs welcoming everyone. Of course they know everyone's name right off the bat and we were whisked away by our butler to our over water villa via a buggy. Our over water villa was absolutely stunning. The ceiling must had been 18' high. When you enter the foyer area, there are two hidden doors. One on the right and one on the left. Right side door led to a pantry kitchen with fridge and a sink. This is where your butler will compose all your food before he bring it into your living room or exterior deck. The door on the left hand side led to a powder room which had another door that led to the deck in the back. Pass foyer and you entered into a marvelous living room. Just about everything in that room was made in France/ Italy. The Italian sofa sat beautifully. The rug was silk or silk blend. A wall of glass windows of view of Indian ocean was beyond. Next to living room you have master bedroom area segregated by swinging panels that can be enclosed. Bed was soft and cozy and they have a huge menu of pillows you can choose from should you not like the pillows on the bed. Pass bedroom you come to a gorgeous free standing soaking tub and behind the feature wall with a Vincent Beaurin's limited edition coloured spots artwork is a rain shower enclosed by glass walls. Behind the bedroom there is a beautiful closet with ample closet space and drawers to put all your clothes. Astonishingly each drawer is lined with stitched leather lining. This kind of detailing is done only for very expensive private homes as the cost can be prohibitive. I have never seen this done in any hotels/ resorts. Each villa is given two bikes which is great as they allow you to come go as you please. Waiting for a buggy to come pick you up never takes a long time but I prefer to be on the go when I want to so bikes are great. I didn't realize this until later.... in order to stop these bikes, you have to pedal backwards. There are no brakes on handles. One time I almost flew off my bike because I couldn't stop! Besides biking, there was snorkeling right off our villa. The amount of tropical fish I saw surpass what I saw at Hanauma Bay. In fact, one day I must have seen hundreds and hundreds of tuna fish right below our villa. I have never ever seen that huge of school of fish in my life except on TV. They were swimming in circles for unknown reason. Besides fish, I saw a sting ray, several squids, and dauphins. It was just incredible. Of course there is also a gym next to the main complex. I went there to do an hour of workout. I was the only person! HA! Speaking of working out, I was trying to burn off all the delectable food from various restaurants on the island. Food at this resort was just incredible. I would say most of them minimally one Michelin star and their signature 1947 would be a two Michelin stars level food. To achieve this level of cooking in the middle of nowhere is astonishing to say the least. The Italian restaurant Deelani near seaplane drop off was yummy. Every single pasta dish we had were perfectly cook and presented. However, cost of food was eye watering. Two pasta dish, one pizza, and two ice tea came out to be $250! This was almost double what it would had cost at Cipriani in NYC. But then again, we were in the middle of nowhere.... Food at 1947 was great. I don't know how they can cook this kind of food in a place so far from anywhere. The tab without wine came out to be $1000 for two! So food was definitely pricey but at least everything we had was tasty. At some point, you just want them not show you food bills anymore because what's the point? Diptyque is their signature Japanese restaurant. If you are into sushi/ sashimi, then you are in for a treat. Their cooked Japanese food is just so so. I would not bother with this restaurant if you don't eat raw fish. The worst (expensive) food I had onsite was their Maldivian night. The food was like a bad Sri Lankan food and for $175/ person, I would skip it. On top of that, resort had a group of teenage kids came out and do awful singing and dancing. It was atrocious. I was expecting Hawaiian luau but I feel like I got punked instead. Luckily they alternate the entertainment with a small band that come out after those teenage boys and sang Maldivian version of American popular songs which was very lovely. The lead singer had a beautiful voice. The spa island is something one must try. In order to get there, I had to take a small boat. It was actually rather lovely to have to take a boat to get a spa treatment. Once you arrive on the spa island, you enter this gorgeously designed reception area. Your treatment specialist then take you to a small private villa where you get pampered. I had a deep tissue massage and it was the best hotel/resort massage I ever gotten. My guy was from Malaysia and he went in deep. Nothing I hate more is getting a massage where your masseur just lap on oil and roll that oil back and forth on your back. This guy attacked my knots and at the end, I was a whole new person. In the villa, they also have a shower where you can rinse off and a whole area where ladies can reapply their make up. They even supply a large selection of Guerlain products in case you didn't bring yours. It's a very thoughtful touch. On the island, they also have a spa cafe. It's a lovely space to watch sunset and sip on fresh juice. My understanding is that once Cheval Blanc Randheli opened, a large section of people from One and Only resort came and never went back. I was told that One and Only resort is much bigger thus had hundreds of rooms versus less than 50 at CB. Because the One and Only resort had the land, it's more private. However, if you are looking for topnotch villa finishes and food, CB is it. I would like to try One and Only someday as well as Four Seasons Landaa Giraavaru. When that happens, I will put Cheval Blanc Randheli as the last resort I visit among all three as I have a feeling, it is the best one. Until then, I shall go back to relive my time at CB via videos and photos.